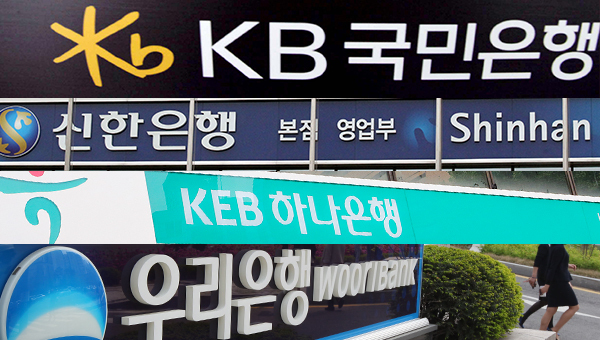 South Korea’s four major financial holding firms – Shinhan, KB, Hana and Woori – are reaching out to overseas institutional investors to win their confidence and bolster their stock prices. Banking stocks have lost appeal as their bottom line has become questionable under loan regulations of the liberal government and protracted low-interest rate environment. Shinhan Financial Group Chairman Cho Yong-byung will fly to North America for an investor road show planned for Apr. 14-23. His mission is to attract investment from Canada Pension Plan Investment Board, a state corporation dedicated to oversee and invest funds of the Canada Pension Plan (CPP). In the middle of next month, Woori Financial Group Chairman Sohn Tae-seung will leave for his first round of overseas IR tour since taking office. He is scheduled to visit key pension funds and asset management firms in Hong Kong and Tokyo. Earlier this month, KB Finance Group Chairman Yoon Jong-gyu held meetings with foreign shareholders and potential investors in Hong Kong and Australia. Major banking stocks in Korea began to lag from last year when the price-to-book ratio that measures a bank`s market price in relation to its book value fell to a record low of 0.42 times. The figure means the current price falls short of even half the bank’s entire asset value. The slumping stock price is largely blamed on foreign selling spree. Foreign investors dumped banking stocks worth nearly 1 trillion won ($876.7 million) in the past year, according to Hana Financial Investment data. Their average ownership of banking stocks in the portfolio stands at 56.4 percent, down by 2.5 percentage points. Top management leaders of financial holding firms are tasked to retain or increase foreign shareholders, particularly pension funds. In February, Shinhan Bank formed a strategic and financial partnership with IMM PE, a Korean private equity fund, to strengthen operational capabilities and to appeal to shareholders. Woori Financial Group Chairman Sohn will have a meeting with a pension fund in Tokyo next month. KB Financial Group is committed to strategic mergers and acquisitions in the high-return life insurance market to win back investors. Hana Financial raised its dividend payout to shareholders. 4The global economy due to enter recession: New York Life Investments C..